Samsung B7300: The toned down Omnia? So, it's not something new, except maybe this is the 2nd all Touchscreen windows mobile phone that Samsung has released aside from the Omnia. 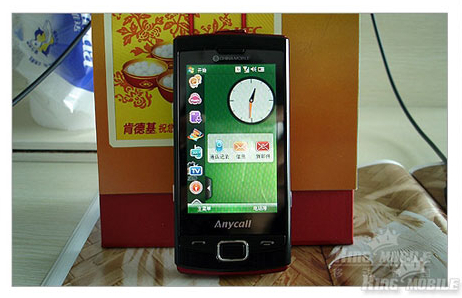 The Samsung B7300, touting the Anycall (Samsung's Korean business name) logo, has been leaked, according to GSMArena. The design of the Samsun B7300 closely resembles the Samsung Tocco Ultra Touch, plus it also has the TouchWiz UI. There's nothing else that was mentioned about the specs aside from a 3 megapixel camera (that's why I call it the toned down version of the Omnia) and runs windows mobile 6.1. Looks good. Though there's no word if it would be released here in Europe.